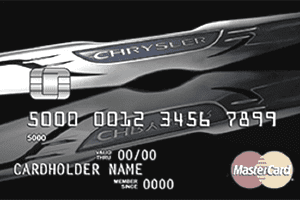 Chrysler offers a credit card called the FCA DrivePlus Mastercard, which allows you to redeem points for parts, service or a new Chrysler, Jeep, Fiat, Ram, or Dodge vehicle. If you're looking to purchase a new car, the FCA Mastercard might help you save money on the purchase price. The Chrysler MasterCard was designed for Chrysler, Jeep, Fiat, Ram, and Dodge customers who want to earn credit card rewards toward future dealership purchases. Credit seekers with a good or excellent credit score (600+) have a good shot at being approved for this card. This card offers zero percent APR on purchases for the first six months on dealership purchases of $499 or more. After the introductory period has expired, you'll receive a purchase rate of 15.24% to 26.24% on purchases and balance transfers. There is no penalty APR with this card. A $1,000 Bonus Certificate is awarded towards the purchase price of your next vehicle if you spend $7,500 within the first year on the DrivePlus℠ Mastercard®. With this loyalty rewards credit card, you earn five points per dollar on qualifying purchases made at FCA dealerships, including a new vehicle purchase or lease, parts, repairs, accessories, and maintenance. You also earn two points per dollar on qualifying travel or gas purchases and one point per dollar on all another spending. You can use your points to buy tires, get discounts on service and parts, and oil changes at FCA dealerships, or to purchase or lease a new Chrysler, Dodge, Ram, Jeep, or Fiat vehicle (at participating dealerships). You can also redeem them for many other rewards, including donations to charity, gift cards, or cash back. There's no limit on the number of points you can earn, and points expire on a first-in, first-out basis after seven years. The card comes in Chrysler, Fiat, Jeep, Dodge and Ram varieties. There's no pre-set spending limit, although your actual limit will be at the discretion of the card issuer, First National Bank of Omaha. If you're looking to buy a Chrysler, Jeep, Fiat, Ram, or Dodge vehicle soon, and want to earn rewards toward your next car, check with the dealership to see if you can use DrivePlus Mastercard to pay for a portion of it. If you qualify, you may be able to save a fair amount of money off the purchase price. Both the Toyota Rewards Visa and the Lexus Pursuits Platinum Visa also offer similar deals, although there are limits on the number of points you can earn and redeem on a new card. Some of the rewards offered by the Chrysler MasterCard aren't nearly as good as the GM Flexible Earnings Card. The GM card gives you three percent back on all of your spendings, not just at GM dealerships, which you can use toward a new car. However, the card that's right for you may depend more so on what car you'd like to buy and the offers from that manufacturer.